This interesting surname, recorded in English church registers from the mid 16th Century under the variant spellings Sandiland, Sandilands, Sandeland and Sondland, is ultimately of Scottish territorial origin from the lands of Sandilands in the Upper Ward of Clydesdale. The name derives from the Old English pre 7th century "sand", sand, plus "land", land, a reference to the sandy soil in the area. 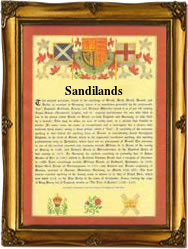 In 1348, the Sandilands family were confirmed i their ownership of the lands from which they derive their name by a charter from William, lord of Douglas. One James de Sandylandes appears as a witness in the "Register of Sancto Marie de Neubotle" in 1357, and in 1424 one, James Sondelond Lord of Calder, had a safe conduct into England. On August 3rd 1550, Thomas Sandland and Alyce Atkyns were married in St. Margaret's, Westminster, London, and on November 6th 1565, Leonard Sandeland, an infant, was christened in Wolborough and Newton Abbot, Devon. The first recorded spelling of the family name is shown to be that of James Sandilands, a vassal of William, Earl of Douglas, which was dated 1336, in the Records of Land Grants in Peebleshire, during the reign of King David 11 of Scotland, 1329 - 1371. Surnames became necessary when governments introduced personal taxation. In England this was known as Poll Tax. Throughout the centuries, surnames in every country have continued to "develop" often leading to astonishing variants of the original spelling.